If you live in Arizona, chances are you have seen these creepy crawlers in the dry, dirty areas within the desert, maybe even in your home! These creatures are relatives to the spiders, and are even family to ticks. Scorpions have evolved into a creature that has withstood the test of time. They have lived for millions of years and will continue to survive in almost any area due to their ability to adjust. From the warm tropic climates, even scorpions in Mesa, to the freezing, sub-zero temperatures, Scorpions withstand these hot and cold environments by adjusting easily and quickly to the area. You may have known that there are several species of scorpions throughout the world, but did you know that not all species are venomous or deadly? Only some of these creatures’ posses poisonous venom strong enough to kill their prey or potential dangers while some are strong enough to kill a human being like the scorpions in Arizona. This is because the scorpions have adapted to their environment, which means they have adapting to the threat levels and prey of that surrounding environment. Typical prey will consist on the area the scorpion has made it’s home, but a meal usually consists of any other insects. If food is scarce, they can survive on eating every couple weeks, even months before finding a new prey. Because of the unknown scorpions face when it comes to eating, another adapting technique they possess is it’s eating pattern. Scorpions can control their metabolism rates to process as little as one insect for an entire year! But this does not slow them down, even with as little food as one insect per year the scorpion is still fast and able to catch many more prey. You have learned that scorpions can adjust to any environment, hot or cold, with food or without food, is there anything the scorpion cannot adjust to? Scorpions have not adjusted to living in areas and environments with no soil. In order to survive prey, the scorpion must be able to burrow or hide itself. Although Arizona has no grassy areas or wet soil to hide them, they have adjusted their coloring to be less noticeable in the dry, dirt areas in the desert that offer little protection and cover. If you are dealing with a scorpion infestation, do not remove them yourself. Leave it to the professional scorpion exterminators to remove these dangerous creatures from your home or elsewhere. 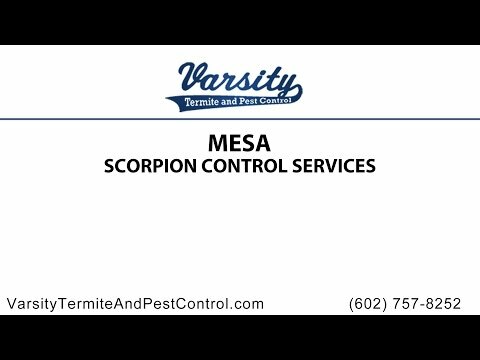 Call Varsity Termite and Pest Control or visit online to schedule a free consultation for scorpion removal. If you have anymore questions about scorpions or want to know more information, please give us a call today and we’ll be happy to help you with any needs or concerns you may have.